Looking for help as soon as possible! I bought my HTC one 5 weeks ago. I powered off last week and the phone would not come on when I went to power up again a couple days later. Took it to the dealer who said he has not seen this happen and also could not get it to work. I asked him if all my photos, videos etc would transfer over to my replacement phone once I received the new one. He said not if I didn't back them up online! I hadn't done that yet since I have only had the phone a few weeks but I have taken a ton of pics and video of my kids and I am desperately wanting to know if there is a way that I can transfer these things to my new phone. He said because he can't even get my phone to power on there is no way to upload these things now and I will lose them I received my new phone today but before I set it up I need to know if there is any way for me to save my pics, etc. I thought these would transfer with my SIM card...? Can you please help? Thanks so much! 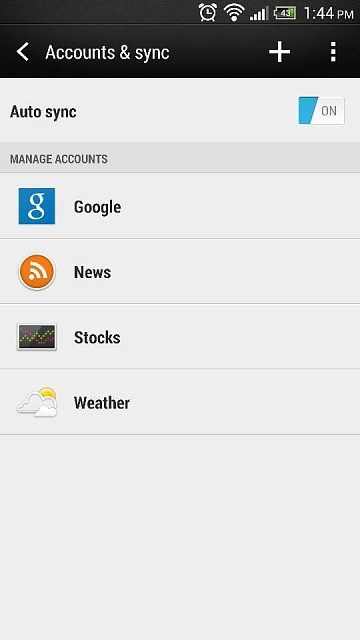 If you had a google account on device, everything should be backed up. Now the question is have you left your dead HTC One on the charger for at least 4 hrs? It may be a completely dead battery. Have you tried plugging it into a computer to see if it registers as external storage? I doubt it would since the phone can't lower on, but it's worth a shot. Thank you. I don't think I was auto synched and not even sure if I had "google" acct other than gmail and nothing was saved there. I did try plugging it in and it said hardware found but error occurred and devise might be defective. I appreciate the reply though. How do I set up my account and auto sync it once I get my new phone so I don't have to worry about this happening again? Thanks again! I'm sorry to hear that. Do you have the HTC drivers downloaded? Installing HTC sync will do that for you. For your new phone, your best bet is to set your auto sync settings to update daily. You can do this by going to settings, accounts and sync. If you have a Google + account, you can have your images sync directly to that. You can use HTC sync to sync your images to your computer, or you can use a storage program like dropbox. Thanks again Jennifer. I am going to check out a couple of other options which were suggested to me. I will definitely be doing the auto-sync daily when I set up my new phone so I never have to worry about losing my photos or other files again. This is my first smartphone and I have been just recently figuring out all the ways in which it can simplify things for me. I was loving it until it died...which is also still a mystery as to how/why that could have happened...most likely a factory defect is what the dealer told me. Anyway, I'm glad I found this site and appreciate your assistance and suggestions. I'm sure I will be posting with questions again as I start to learn more about the functionalities the HTC one offers. I use drop box. I can be away from home all day taking pictures, I come home, WiFi turns on & all my pics automatically upload. If I lose my phone tomorrow - God forbid - all my pics are in my drop box on my pc. Dropbox is the only way to go! There are a number of very workable solutions, dropbox, skydrive (with android explorer for Skydrive), g+, htc, flikr, etc. All of them can be set to auto-upload/backup photos and videos. In my case I use google because I frequently use g+ so it makes everything easy for me, but any of those can work. I'm so sorry you had to learn the hard way why you want to enable one of them. At least look on the bright side: in the future you can have peace of mind once you see the backups in action. Good luck! This has just happened to me!!!! Did you find a way to do it?? All of my honeymoon pics are on my phone!! Any help HUGELY appreciated!! Thanks!